Why did the World Chess Federation grant a title to Phiona Mutesi that she didn't really earn through skilled play? Phiona Mutesi is a Ugandan chess player, now age 16, who was accorded the title Woman Candidate Master at the 2012 Chess Olympiad. The minimum Elo rating required for that title, normally, is 2000. At the time, Phiona's Elo rating is 1622. Clearly, she did not earn the title. Yet it was given to her on some... show more Phiona Mutesi is a Ugandan chess player, now age 16, who was accorded the title Woman Candidate Master at the 2012 Chess Olympiad. The minimum Elo rating required for that title, normally, is 2000. At the time, Phiona's Elo rating is 1622. Clearly, she did not earn the title. Yet it was given to her on some sort of reach-down. Why would FIDE do this? Update: Sorry. Phiona Mutesi's current Elo rating is 1622. It peaked at 1674 in 2013. Update 2: Some strange things are happening. Suddenly dozens of Rah-rah-Phiona videos appear on Youtube, and she's all over the TV media, and FIDE gives her a chess title that she didn't really earn, and Garry Kasparov indulges her by playing a game of chess with her. Is there some hidden influence behind all of... show more Some strange things are happening. Suddenly dozens of Rah-rah-Phiona videos appear on Youtube, and she's all over the TV media, and FIDE gives her a chess title that she didn't really earn, and Garry Kasparov indulges her by playing a game of chess with her. Is there some hidden influence behind all of this? Hm? Best Answer: I would guess, to encourage the playing of chess in that area and in that demographic. But I can see how it would create antipathy. Perhaps FIDE should have devised another award? I'm posting this here because it provides insight into the blatant racial-intellectual fraud that is often perpetrated by blacks, or, as in this case, on their behalf by the Jews and leftists who both control the mass media and promulgate endless hoaxes about racial equality. Where intellectual skills are involved, it is one thing to be "good for a black." It is another matter entirely to be competitive among whites. Just as an example, let's compare the national rankings of three college engineering programs. Georgia Tech's is ranked at #3. Auburn University's is ranked at #36. Morehouse College's is ranked at #1015. Morehouse College is a black college, and among black colleges in the United States, Morehouse ranks at #4. Rank four is quite a bit more toppy than is rank 1015, yes? That proves my point. Being ranked high relative to other blacks isn't saying much. Being ranked high relative to white competitors is saying a great deal. The controlled media elevate Blacks to celebrity status when they display the most modest talent. There's a young Ugandan female who is being touted as a world-class chess champion, though she is no such thing. She's merely a better chess player than most blacks are. Born in the Katwe area of the Ugandan capital of Kampala about 1995, where she still lives, Phiona Mutesi has won many chess competitions against other blacks. She has been Uganda's women's junior champion in chess three times and is currently ranked as the second-best female Ugandan chess player. But blacks are very much humanity's "little leagues" in regard to mental ability. Where mental skills are involved, it is one thing to be "good for a black," yet it is a different matter entirely to be a ranking player among whites. Yet the Hollywood Jews are going to make a propaganda movie about the "great African chess player," Phiona Mutesi. An American author, Tim Crothers, wrote a book entitled "The Queen of Katwe," wherein he hyped Phiona's chess skills. The Walt Disney Company, a media conglomerate that has been owned and operated by Jews since 1984, bought the rights to make a movie based on Crothers' book. And you can predict, more or less, how it will go. Chess is a game in which players have titles, the highest of which is Grandmaster. But there are fixed standards for all of the game's titles, even the lesser ones. In the 2012 Chess Olympiad's women's division in Istanbul, The International Chess Federation saw fit to do a very long reach-down in order to bestow upon Phiona Mutesi the title of Woman Candidate Master. If Phiona weren't black, this would be called a cheat and an insult to anyone who acquired that same title by earning it through skilled play. Normally, a Candidate Master of Chess must have an Elo rating of 2200 to 2299. The title accorded to Phiona Mutesi is a different title: "WOMAN Candidate Master." The requirement for that title is an Elo rating of only 2000. But, even so, the ICF did a reach-down to grant that title to her. Phiona's Elo rating peaked at 1686 in the year 2013, and it has since declined to 1622 (checked on 22 August 2016). Perhaps the ICF justifies the decision by the hope that it will promote chess in Africa. Or maybe it was just another example of how political correctness corrupts sports. Paul Cowen, a commenter upon an effusive article in The Guardian, observed that Phiona's chess Elo rating sets her equal to "an average-to-weak club player." Which means that if you hardly ever play chess yourself, Phiona might be able to beat you, but if you know what you are doing, you'll probably beat her. And, remember, she's one of the best chess players in Uganda. Now here's the truth. Phiona Mutesi is a better chess player than are most blacks of pure blood. African blacks have an average IQ of 70, and Fiona might possibly have an IQ above 100. That would make her quite a standout over there. But not in the United States, and not in the United Kingdom, and not in Germany, and not in Russia. Compare Phiona Mutesi with her white counterpart, Judit Polgár of Hungary. At the age of 12 (in 1989), Polgár had an Elo rating of 2555, a grandmaster's score that made her the 55th best chess player in the world, at that time. Afterward, Polgár continued to rise in Elo ranking to a maximum of 2735, making her the best female chess player of all time and putting her name on the short list of the greatest chess grandmasters in history. By contrast, Phiona Mutesi's ICF ranking was number 79957 in 2013 and has since slipped to 91039 (checked on 22 August 2016). She's good enough, maybe, to play in your local chess club with a decent chance of winning half of her games. Phiona Mutesi isn't anywhere nearly as formidable a chess player as any white chess champion, and the controlled media for news and entertainment do practice deceit when they present her as though she were in any sense on the same level as a white chess champion. 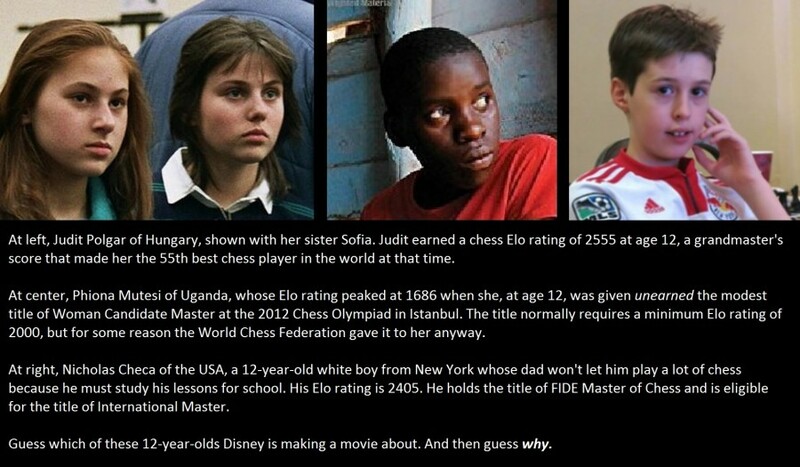 You'd think that Disney would want to make a movie about Judit Polgár or about Nicholas Checa, who are much better chess players than Phiona Mutesi is. But they don't. Disney is abetting and amplifying a race-hoax, using Phiona Mutesi as a patsy. I know that posts like this one sound petty. And, in a sense, they are petty. Phiona Mutesi doesn't deserve to be disparaged for playing chess as best she can. But neither does she deserve the elevation that the controlled media are giving her. I don't criticize her personally because she has not been making the excessive claims about her skill. However, others have been erecting pedestals that she isn't fit to stand on. I have been knocking these over, and I will continue doing it. ¹ In 1976, some non-white countries ran their own, parallel chess competition, the "Against Chess Olympiad," so that they could appear to win something. The winners were mostly Arabs and Hispanics. This is an example of how non-whites must be protected from white competition in order to stand a chance at victory in an intellectual sport. ² Indeed, the very best BLACK chess player in Africa is Andrew Kayonde of Zambia. His Elo rating is 2422, which is only a little better than that of some 12-year-old white boy whose daddy won't let him play a lot of chess because he must study his lessons for school. Note: there are 12 chess players in Africa who are better than Kayonde, but none of them is black. One is white; the rest are Arabs. Heh. This pretty much sums up the situation. Phiona seems like a big fish only when you consider the smallness of the pond she came from. ⁴ Similarly, the Elo rating of Ivy Claire Amoko, Uganda's reigning female chess champion, is 1851 which is likewise short of the minimum that is normally required for the chess title of Woman Candidate Master. But the officials of the World Chess Federation gave her that title anyway. Seems odd when it is just a game to me. Aw, you and your first world problems. You should be given that title! If Chris Benoit were truly obssesed with being the greatest Pro Wrestler, why won't he focus on World Titles? What has more meaning, The Undertaker's streak or Ric Flair's 16 World Title reigns? R&P do questions with R&P in the title seem to grab your attention more than the ones that don't have R&P? How can Andre The Giant went undefeated for 15 years without ever winning World Title+7 other questions?